The programme aims to produce highly qualified university trained urban designers/planners/researchers at a postgraduate level. The full-time programme consists of three core semesters (30 ects/semester) and one final semester for a written or design thesis (30 ects). In each core semester, students take several cutting-edge courses. The design studio is the backbone of the programme. The first year builds up knowledge and skills in urban design and planning. 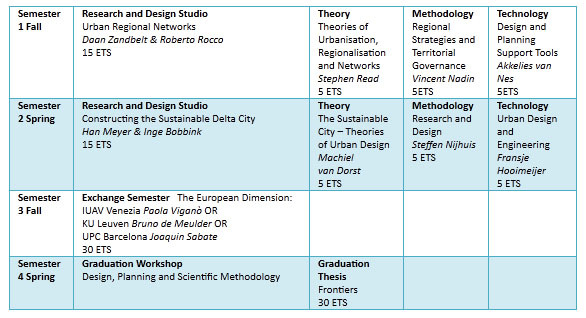 The first semester is focused on the regional scale with the studio Urban Regional Networks introducing students to concepts of governance, dealing with stakeholders and regional design. This studio is supplemented with courses that build skills in reasoning and urban theory, planning history and methodology, and design support systems such as GIS and Space Syntax. The second semester looks at urban design from the local scale to the scale of the delta with the studio Constructing the Sustainable Delta City introducing students to an integrated approach to dealing with water management and climate change in delta areas. This studio is supplemented with courses in water management technology, theory and sustainability and urban design methodology. An annual International EMU workshop after the first year brings together students and staff of all four universities. This workshop builds the platform to exchange ideas on the current and future city and to test design and planning methods taught by the four universities in a cooperative setting. In the first semester of the second year, students participate in an exchange semester in one of the other universities in the consortium. This semester aboard is an important chance to see how urbanism is taught and practiced elsewhere in Europe and forms a perfect compliment to the curriculum at TU Delft. Classes KU Leuven and Universitá IUAV di Venezia are taught in English while classes at UPC Barcelona are taught in Spanish. Students then return to Delft in the final semester to complete their graduation thesis. The semester begins with two weeks of intense workshops that allow students to refine the topic of their graduation project. Students choose topics from within the research focus of TU Delft but are given a broad scope to bring their own interests into the thesis. Many students use their thesis as an opportunity to reflect on what they have learnt throughout the programme to deal with issues from their country of origin.